Beauty products have an alluring quality that tempts us into accumulating more than we intended to. Before we know it we have shelves full of bottles and jars half used and mostly forgotten about. Decluttering your beauty products means not only do you have less clutter and more space, you can pass any unused items onto those in need preventing them from going to waste. The "haul culture" of the online beauty industry encourages consumerism of the worst kind. 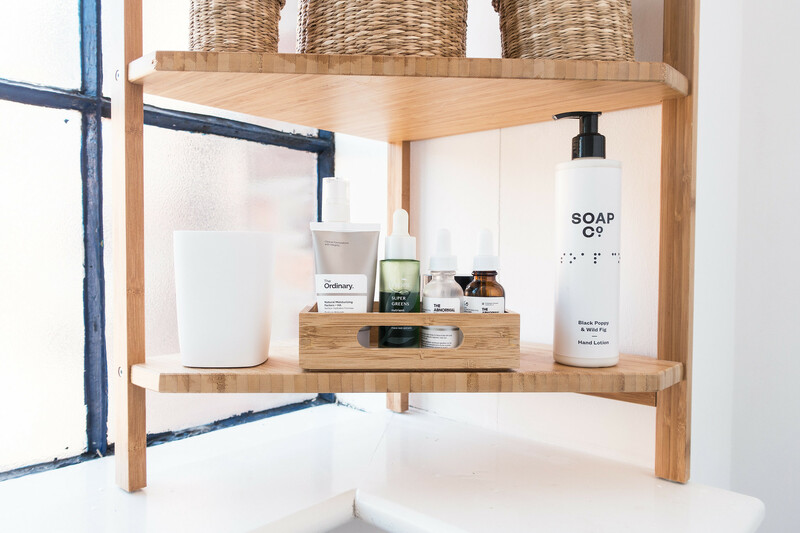 If you want to pay more attention to what you're buying and how it fits into your beauty routine, decluttering is your first step to achieving a simple routine that suits your personal style in both efficiency and effectiveness. Beauty products was one of the hardest areas for me to declutter. I really struggled with letting go of perfectly good, useful products. But when you own more than you can possibly use a little perspective is required. After a bit of a struggle, I finally managed to declutter my make-up into one single bag but it wasn't achieved without a fight! 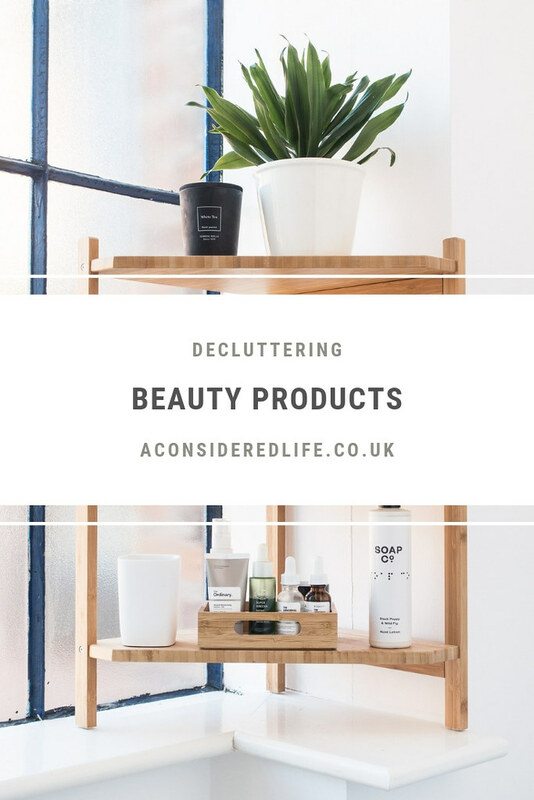 If you want to do the same, I've provided all the tips and tricks I learned along the way in this no-nonsense guide on how to declutter and organise your beauty products. If a product is older than 6-12 months it's likely to have expired and putting it on your face can be the cause of skin problems. Don't think about the money wasted or how much you love the colour just get rid of it. Eyeliner, mascara, and other eye products should be used up and disposed of within 3-6 months. Foundation can last anywhere between 6-18 months and powder cosmetics usually last between 12-24 months. Check the expiry date on each product and if you can't find it or it's rubbed off throw it away. Likewise for anything that is broken, discolored, or looking strangely not how it should. Anything more than a make-up bag full and you've got too many products. There's no way anyone can get through more than a generously sized beauty bag of make-up within a year; products will expire before you've had a chance to use them up. What you'll be left with is a collection of half-used products past their expiry date. There's definitely a sense of satisfaction to be found in keeping a small selection of products you can appreciate daily and use up. If you have a lot of storage for your beauty products, start by getting rid of most of it. Aim to fit all your make-up into one bag (excluding brushes/tools), same with skincare, and one small box for storing any overfill of unopened products. 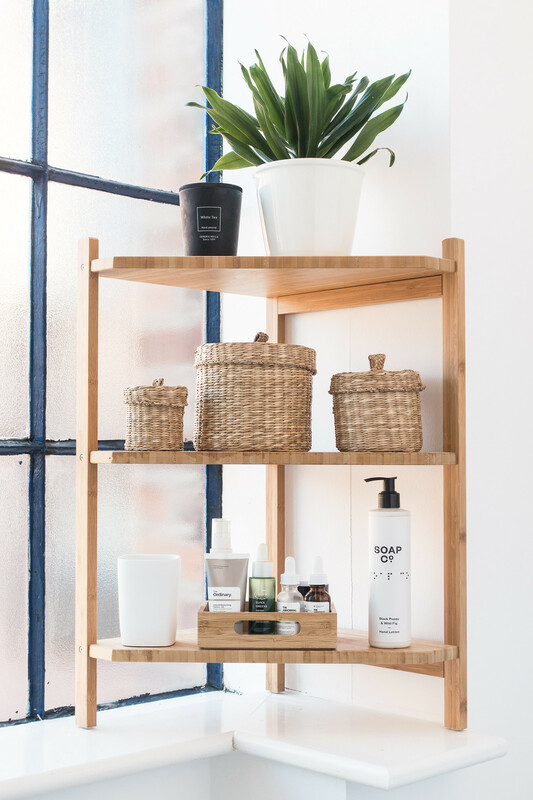 By limiting your storage before you start decluttering you'll prevent the temptation to fill it up with products simply because the space is there to fill. There's a myriad of reasons we're tempted to hang onto products: we like the colour, the shade suits us, it was an expensive purchase or someone gifted it to us. The real issue is we have too much and we're not using any of it enough. If we really truly loved a product we'd be using it every day not letting it sit at the back of a cupboard or in a drawer. How much makeup do you really need? Having choice is wonderful but how far can that go in justifying why you own as much of it as you do? There are a few questions that can help you through the process of decluttering all those products you're having a tough time letting go. When did I last use this? A good indicator of whether a product should stay or go is when you last used it. It's relative to how long you've owned an item but worth asking nonetheless. Used all the time? Keep it. Never used? Pass it on. Simple. Does the colour suit me? Don't keep things "just in case." Choice is good but be honest with yourself; will you actually use a fuchsia pink lipstick or orange eyeshadow? Probably not. Ditch anything that doesn't suit you or is outside your comfort zone. Do I own a similar product? Duplicates and similar items are tricky. On one hand it's worth keeping them because they're the most likely items to be used up; on the other hand, if you have too many similar items it's likely you prefer one over the other. Choose wisely. Will I use it soon? (ie. when my current one runs out.) It's worth keeping items that are next in line for when your current one runs out. Keeping things "just in case" or as a last resort option (an item you don't particularly like but might use) is dangerous though and should be avoided. Would I buy it again right now? This is a really important question to ask about all the products you're tempted to keep even your so-called favourites. If it were to break, get lost, or run out would you instantly replace it? Not sure whether to keep something, this is the definitive question to ask.